Rest in Peace, Sister Agnès-Marie Valois. Dead at the age of 103. With occasional, fatigued glances at life's rear-view mirror from the other side of time. The Canadians on the beach remember that the nuns from her order came down to the beach to treat the wounded. Sister Agnès stood between a German soldier with his gun drawn and a Canadian soldier that she was treating. She had been ordered to treat the German wounded first. She stood up to him when he threatened to shoot the Canadian and she said that he would have to go through her first. Other men remember her tending to their needs at the hospital in Rouen. She has been to many commemorative events as an invited guest over the years. In 1998 the Canadian government awarded her with the Meritorious Service Medal. A good person gone. She will be remembered. EDIT: My uncle Bob was a sapper who landed on the main beach. Badly wounded by mortar fire, he wound up in hospital where he was treated by German doctors who treated him fairly and with respect. Good people there too and they were on the other side. Yesterday, Aug. 19 was the 76th anniversary of the ill fated Dieppe raid in 1942. The anniversary of the event is noted as a back page item or secondary news report even here in Canada where the raid has been analyzed multiple times and of which many books have been written. This was a large "raid" and featured regiments from the CDN 2nd Division. For many, it would be their last day on earth and for many others who became POW, it was their 9 hour war. On August 19th, 1942, the ground forces that were taking part in the raid included 4,963 men and officers from the 2nd Canadian Division, 1,005 British commandos, 50 US rangers and 15 Frenchmen. A fleet of 237 ships and landing barges, including 6 destroyers, brought them near the seashore. In the air, Royal Air Force and Royal Canadian Air Force bombers and fighters took part in the operation. Although some questioned the very concept of a full frontal assault on a fortified position, the British and Canadian strategists were in agreement with the military doctrines that prevailed at the time and success was likely. We have discussed this battle on this forum. It was a disaster and most especially on the main beach in front of the casino. The troops often could not even raise their heads to take a shot. Some 3,367 men, including 2,752 Canadians remained on the beach, dead or soon to be made prisoners. 907 Canadian soldiers died that day. The operation left 1,027 dead, of whom 907 were Canadian. A further 2,340 troops were captured, and 106 aircraft shot down. An American, Lieutenant Edward V Loustalot, earned the unenviable distinction of becoming the first US soldier killed in wartime Europe. You will read articles that try to justify this raid and suggest that it was important because of all the things that were learned that informed practices on the D-day beaches. The men that fought there would disagree and have. So on this anniversary of the event, I would just like to remember all the allied men who were landed on the three beaches or provided naval support and air support, and who paid a terrible price. That includes my Uncle Bob, a sapper with the Corps of Royal Canadian Engineers who was cut down by a mortar and made POW. He was repatriated on a Red Cross exchange and died about 10 years after the war of heart failure caused by shrapnel imbedded in his heart. Thanks for that powerful and poignant post. Do you think that, perhaps, the Brits/Canadians and the US took different lessons from the battle (much as the allies and Germans took different lessons from Crete)? The Brits naturally took the failure as a cautionary tale to not try a cross-channel invasion until everything was REALLY ready (i.e. 1944). Might the US have viewed it as just too small and poorly implemented? Thus, the US was proposing a D-Day style invasion in 1943 until the Brits took them out of it. Terry Copp is a Canadian historian and was a professor of History at Wilfred Laurier University in Ontario. He was also the director of the Laurier Centre for Military and Strategic Disarmament Studies. The following is a short lecture from Copp presented as an assignment to students on the decision making process surrounding the Dieppe Raid. He takes us through the reasons why the raid was mounted and why it was altered in form and then remounted shortly after. Throughout the exercise he poses questions that lead us to ponder whether the raid had initial value, whether it had a possibility of success and, at different stages, asks us to determine whether the raid should have been cancelled. Both the RAF, RCAF and the Navies considered the raid to be a success from their perspective. The Army could hardly say the same given the slaughter that ensued. The Canadians agreed to this raid and made few objections. Canadians had been on duty in England since about Feb. of 1940. Other than a quick trip to France just after Dunkirk, they had been preparing for the German invasion and when that died down, they trained. So they were looking for a chance to get into combat. Two battalions had been lost at the Battle of Hong Kong in Dec. of 1941. Other raids to involve Canadians were cancelled or did not amount to much at all. I do not know whether the US had an opinion on this raid which was organized by Combined Operations HQ led by Louis Mountbatten. The original raid called Rutter was cancelled but was remounted shortly after and called Jubilee. The Canadian 2nd Div troops had been going through commando type training on the Isle of Wight. I am not sure that the security was all that tight. My Dad and his brother George were looking for their brother Bobby. All three had volunteered. Somehow the two made it to the Isle of Wight and approached a gate manned by sentries and asked to see their brother. In the words of my Dad, the guard told them to "piss off" and they went back to England. EDIT: Not sure how my Dad and Uncle George got to the Isle of Wight. I believed the part about tracking their brother down and being told to piss off. I am just not sure that it was on the Isle of Wight. Seems like a higher security area to me. Not too long after, they were surprised by the appearance of brother Bobby at a pub that they frequented. Drinks all round and they were told that Rutter had been cancelled. Bobby didn't say much more than that but the remounted raid called Jubilee saw him quickly recalled to duty. Jubilee was not supported by the heavies of BC as was promised in the initial stages of Rutter. Much of the German defences were not destroyed. and I suppose that that was a lesson learned and not to be repeated at Overlord. Jubilee was shortened from the original plan to about 7 hours when tanks and men would withdraw to landing craft. It was determined that a Panzer group was only 5 hours away and that a longer stay in Dieppe could compromise the ability to extract the tanks. It is interesting that even though the time on the beach was shortened, there was no change in the tactical objectives of the infantry. As it is those Churchill tanks than were landed on the main beach had a great deal of difficulty in moving. Tanks with the chespaling device could move but even then the stone disabled the tanks. The beaches are called chert. I have walked on them and the chert is loose stone ranging from 1 up to about 6 inches in diameter. The chert layer can be over a metre thick. When you walk on it, the chert kicks back, making progress difficult. Why this was not known I do not know but many of the tanks lost their tracks in the stone. Stones would get caught up in the bogey wheels. The plan was that the tanks would shock the Germans and provide support to the infantry. The allies learned that intelligence gathering was critical and that high level photographs weren't as helpful as thought. Of note is that fact that the Germans had not placed heavy anti-tank weapons on the main beach. There were no anti-tank mines. No need. They had already learned that their tanks became stuck in the chert. I am sure that many things were learned but for the soldiers who were cut down like wheat, it seemed that they were sacrificed for nought. Thanks, George : saw the first part of the Terry Copp lecture and found it captivating . I’ll see the sequel later. One thing he said strikes home with me, and although it’s a statement of the bleeding obvious, it’s bears repetition : we tend to compartmentalise history, sectioning off the various episodes and forgetting how, at the time, these things were happening at once, or following fast upon one another, giving the participants little time to draw breath, let alone enjoy the luxury of hindsight. Reading about that chert on the beaches conjures up harrowing images of the way the stone debris must have amplified the effects of firepower. I can hardly imagine a more horrific element to advance over in the face of intense enemy fire. The story of that raid strikes me as grotesque. Many years ago I saw Louis Mountbatten on TV insisting that it was worthwhile in so far as it provided invaluable lessons. I thought his claim rang hollow then, and I still do now. Recently, historian David O'Keefe posited that the reason for the Dieppe raid was to "pinch" one of the 4 rotor enigma machines from the Kriegsmarine HQ in Dieppe. A British commando unit was assigned and did try to get a boat into the inner harbour of Dieppe to do just that. They tried on a number of occasions but the beach was just too hot. The Canadian battalions assigned to take the beach (from memory, Essex Scottish and the Royal Hamilton Light Infantry) were being slaughtered though some did get into the town proper and raised hell for a while. Ian Fleming of the Naval Intelligence Division was just off shore and though other historians say that he was observing, O'Keefe contends that Fleming was waiting for the delivery of the 4 rotor enigma and the codes. O'Keefe claims that that was the reason that CDN Gen. John "Ham" Roberts committed his reserve regiment the Fusiliers Mont-Royal (FMR's) and not because of confusing communication from the beach that the Essex Scottish had met their objectives. Ham Roberts wore the goat horns for this failure at Dieppe. Churchill, Hughes-Hallett, Leigh -Mallory and Mountbatten all took verbal shots at Roberts. They too deserve to be held accountable for this failure. Anyway, many historians appreciate that O'Keefe's research on the "pinch raid" was extensive but most are not convinced that the 4 Rotor Enigma was the sole reason to mount the raid and to press on when failure seemed assured. O'Keefe has some compelling evidence consisting of British orders on paper that confirm the importance of getting the commandos to the naval HQ in Dieppe and that Ian Fleming was in charge. I believe that the raid had multiple objectives with pinching the enigma machine as one of them. O'Keefe's book on the subject is entitled, "One Day in August: The Untold Story Behind Canada's Tragedy at Dieppe". Nothing to be learnt from the raid at Dieppe, except how not to do it : a little late in the war to learn that lesson . That's a citation in the conclusion to the article on the tanks that you attached. The words are those of Charles Carrington - a British army liaison officer attached to the RAF at the time of the raid.. I was rather thrilled to read that : I met Carrington in the mid 1980s, when he delivered a lecture on the Great War, in which he served throughout from 1914 to 1918, starting as a subaltern. His words carry great weight : as good a summary of that hideous affair as any that I’ve seen. I recoiled slightly from a comment made early in the essay, when O’Keefe writes that Dieppe raised ghosts of Passchendaele , the “disaster” that had occurred twenty five years earlier. The Canadians at Passchendaele were singularly successful, although their casualties had been heavy. Thanks Phil. O'Keefe is convinced that his "pinch raid" theory is accurate. He has had trouble convincing other historians I think. I did not find his comparison to Passchendaele to be particularly apt. I can tell you that he also made a documentary based upon his book and findings. The documentary was shown to a few of the surviving veterans of Dieppe. It was touching to see a couple of them break down when told that the raid did have some purpose. One of them, through tears, said that at least his buddies died for something. I like to think that even if inaccurate, O'Keefe's thesis brought some comfort to a few men who are nearly all gone now. I wonder how much, if any, of the motivation for the operation for Churchill was that it was sort of a "commando raid" writ large. He was fond of jabbing the Nazis with raids. I agree with the comment above that the "lessons were learned" assertion is a whitewash. In August 1942, the Germans were deep in the USSR with no swift victory in sight. The raid has the feel of a "kick on the back door" to test the ardor of the German troops on occupation duty. It was so damned expensive : several thousand casualties, about one third of them killed. Had this been anticipated ? At Passchendaele , the commander of the Canadian Corps predicted the casualties his troops would suffer to an astonishingly accurate degree. Had the Canadian command at Dieppe countenanced the likelihood of close to one thousand of their men being killed, and twice as many captured, from a force of fewer than five thousand that was to disembark ? Editing : If this crucial aspect has already been alluded to in those links, then apologies for overlooking ! I note that in the St Nazaire Raid, 168 of the 622 commando and naval personnel deployed died : so there was a stark precedent to gauge by. Another emotional frisson grips me when I look at that photo of one of the Bletchley Park huts in 1943, with the women busy at their work : one of them might have been my Mum ! This morning, at breakfast, I enjoyed conversation with a gentleman who alluded to Lord Louis Mountbatten , and provided me with an anecdote that rather amused me. Thank's for posting that great article & video! Certainly a heroic episode I WWII! U.S. Marines barred from the June 6, 1944 landings. Sixty-years-ago, along a 60-mile stretch of France’s Normandy coastline, a combined force of American, British, and Canadian soldiers began streaming ashore as German artillery, mortar, machine-gun, and rifle fire ripped into their ranks. The mission of the Allied force was to kick down the door of Nazi Germany’s Fortress Europe, and then launch a drive toward the heart of Adolf Hitler’s Third Reich. The Canadian soldiers who landed on Dieppe's beaches were not without amphibious training and what was termed commando training. It took place on the Isle of Wight. Having said that, two exercises in preparation for Jubilee, Yukon 1 and Yukon 2 did not go particularly well partly because the amphibious landing vessels were late to the practice beach and the armoured support was also late. Time constraints in preparation meant that there was no time for battalion level training. Believe me, Canadians have analyzed this battle from every different direction. The consensus is that these men were sacrificed and all that blow about lessons learned that were applied to D-day operations is dismissed by some historians and certainly by the soldiers, most now dead, who were there. Just under 1000 killed in a 9 hour operation. Here is one analysis of the training scheme for Jubilee as it pertained to one regiment, a French-Canadian regiment called Les Fusiliers de Mont-Royal. Note that 160,000 French-Canadians volunteered to serve in Canada's forces during the war. The volunteer rate in Québec was not as high as in other provinces. I just felt that I should note that many men and women did step up. 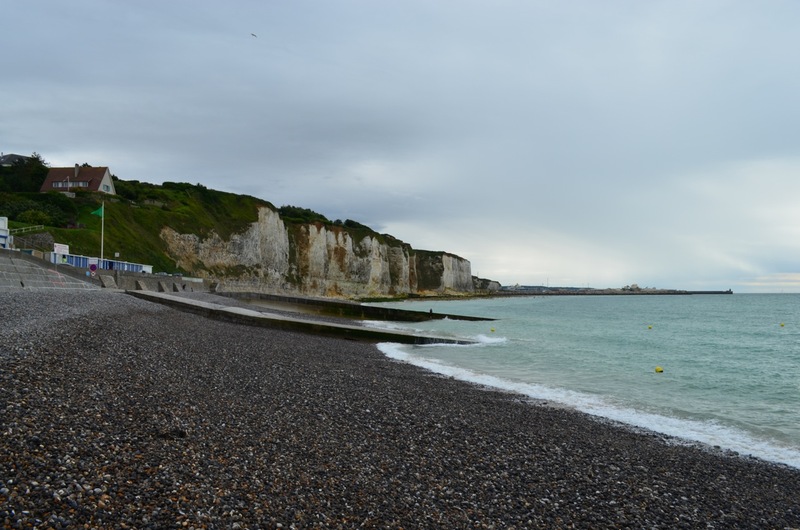 584 men of this regiment landed on the Dieppe beaches. 125 made it out. The British Royal Marines are outstanding soldiers with experience in amphibious landing and it was the RN that provided the greater number of vessels to the landings at Normandy. The Royal Marines had been organized into commando units. So I am going to suggest that there was expertise available and it was used. The Dieppe Raid was a disaster and the Canadians should have refused the mission especially when it was remounted. It went in without the naval support originally demanded. The element of surprise was lost as the landing ships amassed for the trip in. Tanks could not negotiate the rocky beaches covered with chert. I suppose that more experienced troops could perhaps have had some greater success but I doubt it. On two of the beaches, the men were cut down as they left their LC. The Germans had most of the beaches covered with enfilading MG fire. On the third, Pourville, the South Saskatechewan regiment landed and headed inland to get to the radar station. Part of what they were to do involved seizing some of the radar installation. With them was a British soldier and radar expert. The Canadians were supposed to kill him if it became clear that he would be captured. Still some men did get into the town of Dieppe. Many were killed when the order came to head back to the landing craft. There was considerable bravery shown but on the main beach, to raise one's head to fire one's rifle meant that you would be cut down. The only shelter was at the sea wall and men huddled there under continuous fire. The most eastern beach was at Puys with its high cliffs. The Royal Regiment of Canada had been scattered at sea when the Germans discovered the boats. They landed without any element of surprise. So would the US Marines have had some valuable information. Indeed but this mission failed for many reasons including poor planning, lack of surprise, changes to naval and air support. Training was a factor too but it would be difficult for me to see how, given the same circumstances that any other units would have charged from their LC's and achieved objectives. Just what well of experience are the Marines drawing from in Aug of 42? And the "largest amp landing in Aug 41 in the Carib." ensured flawless operations at Guadalcanal/Tulagi and Tarawa to name two examples of FUBAR. Um, no sorry John, but you are confusing things a bit. FLEX 1 through 7 were the prewar FMF exercises held, mostly in the Caribbean at Culebra and Vieques. They were all fairly small, rarely exceeded 1,000 men and associated equipment, and were often used to test specific items of equipment or landing vessels. The last was FLEX 7, held in February 1941 and tested the new Destroyer-Transport with three of them carrying three companies of the 7th Marines. The August 1941 exercise was at New River, North Carolina and in Chesapeake Bay and tested the command structure of the new 1st Joint Training Force, Atlantic Fleet, from 28 Jul until 12 August 1941 when it was redesignated the Atlantic Amphibious Force. It was comprised of the two regiments of the 1st MARDIV then extant and elements of the U.S. Army's 1st ID. The results of the New River exercise revealed some of the shortcomings in then current amphibious doctrine and organization. As Holland Smith said in his report of the exercise, "considerable delay in the debarkation of troops and supplies was caused by lack of personnel in the Shore and Beach Parties. ... Roughly, the supplies except for subsistence it was possible to land ... were insufficient to sustain the forces engaged for more than three days." Dieppe and Guadalcanal were near contemporary and drew from the same shallow well of experience. Would their knowledge have been more valuable than that of the RN and the Royal Marine Commandos? The USMC was involved in its own training for amphibious landings. Prior to entry, the USMC had sent a Major Arthur Mason to observe the amphibious training methods of the Royal Marines and especially to check out the British landing craft. He was the first of many officers sent to Britain to observe the Royal Marines and the RN. Later, the USMC officers would attend the British Amphibious Warfare school at Rosneath in Scotland. Note that pre-war, the Marines dressed in civilian clothing. I presume that the US did not want to advertise that they were training with one of the belligerents. They also studied the use of specialized units of the Royal Marines and determined that these would be valuable in the USMC. They sent marines to the UK for Royal Marine commando training. That was in June of 1942. An officer and 10 men took part and found the 7 week programme gruelling and valuable. The British heaped a lot of praise on the Marines and were impressed with their enthusiasm in training. Dieppe was on Aug. 19, 1942. Marine aviators also came to GB to confer with the RAF which had defeated the Luftwaffe in the Battle of Britain. That doesn't mean that information on tactics was not shared but the Royal Marines were involved in training the Canadians. Now whether the Canadians had had sufficient time to absorb the training is another issue. As I mentioned before, two of the amphibious landing schemes were unsuccessful. I believe that a third was and co-ordination between the land forces and the RN was better. As well, the Canadians who had been in England for months had only recently embraced British Battle Drill Training. The other point is that the USMC was as busy as hell in the Pacific were they not? The USMC were involved in Operation Torch. Where were they deployed after that? Something on USMC pre-war preparation and expansion. There is a good section on the USMC training with army and RM commandos. Now I don't believe that any US Marines actually participated in the Dieppe landing. The US contribution was 50 Rangers who went in with 3rd British Commando at Berneval to attack a German battery. (doing this from memory). But it was interesting that they were on the Isle of Wight where the Canadians were receiving what they called, "commando training". Two Marines were also attached to the British Combined Operations as liaison to that group and Lord Mountbatten. They were involved in some of the planning for Dieppe. And they observed the debacle from HMS Firnie off the coast of Dieppe on Aug. 19. Three US Marines were to join US Rangers on the Dieppe Raid but the that was for the first incarnation of the raid. When that was cancelled, those three Marines were assigned other duties and did not participate in Jubilee. Shortly after Dieppe, the Marines who had been involved in the planning and observation returned to the US to share what they had learned. Heinl's Soldiers of the Sea was written as a general history and is not as well done or detailed as some of the colonel's other works. I am not familiar with Sloan's work, but it appears to be a standard first-person account of Peleliu rather than a doctrinal study. In any case, I got my information from The History of U.S. Marine Corps Operations in World War II, Volume I, Pearl Harbor to Guadalcanal, and especially Part I., Chapter 2, "Evolution of Modern Amphibious Warfare, 1920-1941", Volume IV, Western Pacific Operations, Part II, Chapter 1, "The Development of FMFPac", and Volume V, Victory and Occupation, Part VI, Chapter 1, "Amphibious Doctrine in World War II", A Chronology of the United States Marine Corps 1935-1946, Volume II, which details the various Fleet Exercises, and finally, Holland Smith's Coral and Brass, Chapter III, "World War I and the Inter-War Years" and Chapter IV, "World War II Begins in Europe, Marines Train for Amphibious Warfare". While I have not re-read them recently, I did review them again and they give considerably more detail than Heinl and I suspect Sloan on the subject. I will repeat, none of the Marine Fleet Exercises (FLEX) prewar were large affairs and the large one that occurred in August 1941 was not in the Caribbean, it was North Carolina, so if one of your sources stated it was then they are incorrect. The New River exercise revealed a number of problems in Fleet amphibious doctrine and organization, some of which were corrected, but many of which were not, prior to August 1942. It also did not reveal some key shortcomings in doctrine, especially for naval gunfire support, which were not corrected until after November 1943. Critically, few of the contemplated landing craft were available for testing and only 401 had even been manufactured (not including the pre-1940 prototypes of unsuccessful designs tested 1934-1938 in various FLEX), so only limited experience was gained with them. There were no LCT and only seven of the failed "artillery lighter", so little could be learned about landing heavy equipment and vehicles (the British had already completed and used 30 LCT-I, were commissioning its successor the LCT-II, and completed design of the LCT-III). Higgins' LCP and Roebling's LVT were just beginning to show their potential, while the British had already conducted operations with their LCA. So no, I still do not believe there was much either could "learn" from one another...except possibly how much each needed to learn.